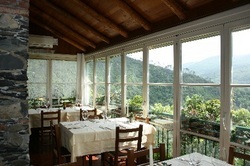 The Cinque Terre is made up of five small coastal villages, Riomaggiore , Manarola, Corniglia, Vernazza and Monterosso. Only an hour away, it makes the perfect day trip. Picture it...a leisurely breakfast on the terrace, a short drive into Chiavari, park your car for free at the Marina & set off for a day's exploring either by train or boat. The train from Chiavari stops at all 5 villages or during the summer months you can take a ferry boat from Chiavari. Otherwise, drive through the Cinque Terre along the ancient Roman road with its spectacular scenery and amazing views over the Ligurian Riviera.There are many beautiful walks between the villages where panoramic footpaths are managed by the Club Alpino Italiano....'Love Walk' is perfect for those who prefer to do it in heels...choose any of the others if you plan on bringing your walking boots! The villages are miniscule and extremely picturesque having preserved their old world character. The rare and endangered species of flora and fauna are protected in the Nature and Marine National Park, which covers the entire area up to Portovenere. 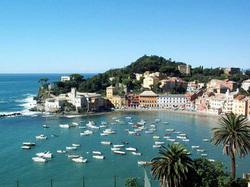 Half an hour away is the beautiful Sestri Levante, a small historical town on a peninsular. The photo here is of the smallest cove named 'Silent Bay' ....a perfect sandy beach to swim or hire pedalos. 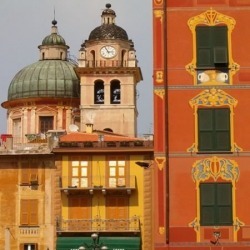 Take the train or drive to Genoa in under an hour. 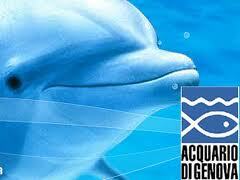 Together with the aquarium is also the Città dei Bambini which is a fantastic science learning experience for all ages. Or go up in the panoramic lift for a view over the whole city & bay. 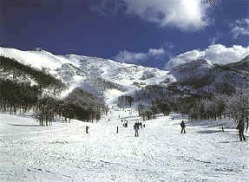 Within an hour's drive away is Parco d'Aveto.In spring & summer it's filled with rare plants, amphibians and insects. Its pastures have been preserved for cattle breeding and the production of cheese which you buy locally.The park holds a stunning, tranquil lake which is set against the dramatic peaks of the Ligurian Appenine, between 1600 to 1800 meters altitude. If you're lucky, you might sight one of the wolves or falcons which habitate this amazing park. Guided tours also at night are available in spring thru autumn and the newly opened Ski Run at Santo Stefano provides fun in winter!